In the last episode of Flash S4 E10, The Trial of the Flash. In the court room when Iris tried to tell everyone that Barry is the Flash, he move fast and tell her to not tell anyone. How did Barry speaks to Iris when he is moving fast? Even if Barry move Iris fast she would not know she is moving, then what happened? BARRY: We're moving so quickly that everyone is still. IRIS: How are you able to do this with me? BARRY: I actually don't know. 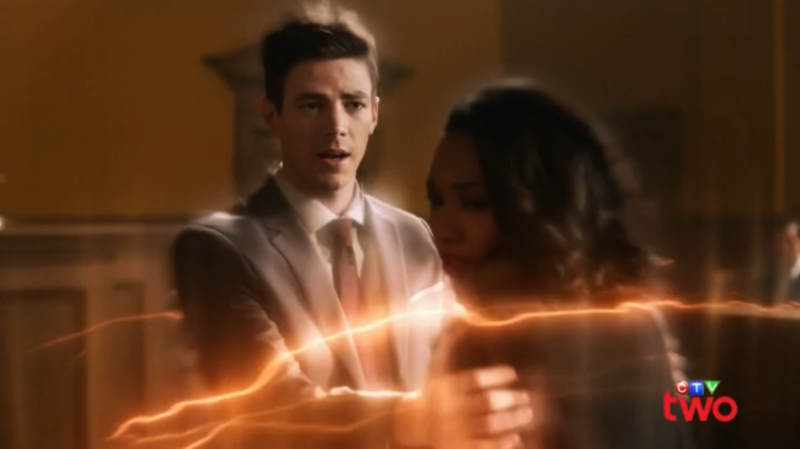 What we can see is that both Barry and Iris are enveloped by the Speed Force so one must assume that Barry has (somehow) extended the influence of his "speeding" to encompass them both so that they are both moving at the same rate (but still to everyone else). Since they are moving at the same speed, she can hear him talking to her. At the time of the episode, it was completely new and unexplained. Barry himself said he didn'T know how he did it. It seemed to be more of an instinct than an actual skill. It is important to mention that, at this point, Barry had only ever used Flash Time (the name comes up in the later episode "Enter Flashtime") for very brief amounts of time. This "power", which boils down to moving (and thinking) so fast that the rest of the world seems frozen, had to be used mostly consciously (otherwise he wouldn't get surprised and caught off-guard by literally every single thing his opponents do while fighting him). At this point during the trial, Barry had probably planned on doing something to Iris, maybe write her a quick note and slip it into her hand, or take her out of the room, to prevent her from sharing the information. Then, upon contact, she also entered Flashtime, to his surprise, so he adapted the plan into a simple conversation. The later episode "Enter Flashtime" gives us much more information about this new power (spoilers follow, since the episode is pretty recent). First of all, other speedsters seem to have no problem using Flashtime, as Jesse and Jay need no help at all to use it. But, even with his long career, it seems Jay had never shared Flashtime with anyone, so this is a strong indication that the power is specific to something about Barry, probably the long time he spent in the speedforce since the previous season. It is also shown that physical shape is important to use Flashtime, since Jay, being older, can't use it as long, and Jesse, being less experienced, also eventually has to stop. It is left unclear if Jesse could have used Flashtime on Harry, since the only time she tried, she was already exhausted, and the same goes for him. This ability to share the speedforce was definitely critical to that episode, but it was also fleshed out (after showing up in the courtroom) with more details. Specifially, non-speedsters can't take the increased rate for very long, and have to go back to normal quickly, and the affected area is close to nothing, so other meta powers seem to die out as soon as they are used (Vibe, Killer Frost). It could be a hint that it will be used against the Thinker later on. Somehow sharing the speedforce with a target through physical contact, allowing them to do the same for a short time or until contact is broken. Where do the recaps/flashbacks of Felicity Smoak come from in S01E04? Is the Flash really the “Fastest man alive”? Why is this house bitchin?